What new laurels and accolades can we bestow on Lyric Stage that hasn’t already been said? Lyric Stage is the only theater company in Texas that has the bulk of their productions mounted that are totally fresh and new, never to have been produced before. Now, while the company does produced off and on a well known show,(past titles include Gypsy & Brigadoon), they primarily produced brand new musicals. This makes any musical theater fan (both in the audience and on stage) yelp with glee! Lyric Stage has brought to life some of the finest musical theater productions to its audiences. Some of these include Richard Cory and Abyissina. The company has now even ventured into New York with co-producing with the York Theater Company the musical Roadside, which we metroplex audiences had first dibs to see when it was produced here earlier this season. 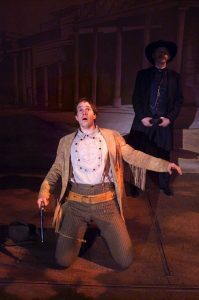 Lyric Stage this time around presents the world premiere of the new musical, Sundown, which centers around Doc Holliday and that well known shootout at the OK Corral. I must confess that I am not a huge fan of those John Wayne western films, to the point that I really haven’t seen that many films dealing with cowboys, gunslingers, and the such. So I walked into the Dupree theater really not knowing a lot about Holliday and the OK battle. While this is quite a different subject to write a musical around, there have been stranger subjects. I mean take a gander at past broadway musicals, they went way out there once and brought to life a musical about Carrie! So why not Doc Holliday?! It was quite interesting to know that Holliday wanted to leave Tombstone,Arizona to become a Dental doctor, only to be sidelined by the Earp Brothers into staying in town for a little longer. Director Cheryl Denson continues to take artistic risks and has not once dropped the ball! She is assigned constantly new or hardly ever produced musicals and the end result is another artistic gem of a production. Denson has a grand eye for visual enhancement to the emotion of the piece that she is working on, and in Sundown you see it. From the opening act number of foreshadowing, to the cryptic and dark ending of Act one, to the tour de force Act Two that has the elements of blocking, vision, costume, lighting, set, and cast that is just breath taking. Take my word, from the number “Poisoned Water” to the end, it is magical theater at its finest! One of the best elements of the production is the score itself. There are nineteen songs interspread within the book, and they are both powerful and beautifully written pieces of music. The score’s best moments come from the solos sung throughout the evening.But Peter Link’s score does for the most hit great emotional arch and the music coming from the orchestra pit (conducted again by the marvelous Nyela Basney) is both impressive and exquisite. Easily the best ensemble number of the evening is “Poisoned Water”, with its lush harmonies of the singers and the commitment of the entire cast on understanding the emotion of the number is wonderful to both see and hear. Link’s strongest work is in the majestic solos for various characters. Some of my favorite arias included, “Arizona Morning”, “The Rest of My Life”, “Bridges”, “Sundown”, “Prisoner”, “Men Aint What They Used to Be”, and the haunting “Another Time”. Each of these solos are gold nuggets! The music written for them is moving, with a light air of country & western mixed in with a light dusting of pop/rock overtones. I wished though that the character “Woman in Black” had a solo of her own. The character truly begs for one. It takes awhile to realize that the character is the Angel of Death, but she has not one song to establish her purpose or reason within the plot. Which is too bad, because I honestly think this is a great idea of having this character in the piece. Gina Biancardi is both tough and loving as “Kate”, she is divine! As for the kudos to the best performances of the evening, those would belong to Kevin Varner (Doc Holliday) and Steve Barcus (Wyatt Earp). The book, score, and characters all circle around one major character-that of Doc Holliday, which is performed here with brilliance by Kevin Varner.Varner also has the best songs of the evening to sing. From the light and airy “Arizona Morning”; to the fun and festive up-tempo “The Rest of My Life”; to the tour de force and deeply emotional act one finale, “Sundown”. The actor sings with passion and gives total commitment to his character. As you may remember, Wyatt was quite ill, thus Varner brings this element as well to the table. His harsh coughing and wheezing is extremely realistic and gives his Act one and Act two finales great subtext. Varner is magnificent in the role. The cast and director are greatly aided by the creative design team as well. Giva Taylor and Susan Mayes’ costumes are perfect in period and detail. Susan A. White’s lighting design could rival any broadway production! Her design of creating “emotional color” is to be admired greatly. Her design of Act two ‘s battle at the OK Corral is worth the price of admission alone! I loved it!Wade Giampa’s set involves platforms and two major turntables on either side of the stage. The sets are designed with authenticity and are painted to reflect sun burned ,worn out wood that actually looks like these buildings have been sitting out in the hot, western sun for years. Not many cities in the United States have theater companies that produced new musicals from scratch. New York has Encores, Los Angeles has Reprise, both are companies that do new or hardly ever seen musicals. We are indeed VERY lucky to have our very own such company right here in Dallas! Lyric Stage is currently in its ninth season, and with productions like SUNDOWN, they will be here for another ten years! And for that, both audiences and our metroplex artistic family are very fortunate to have.